AccuraCast SearchStarz Blog: Google's Evil and it Hates You. 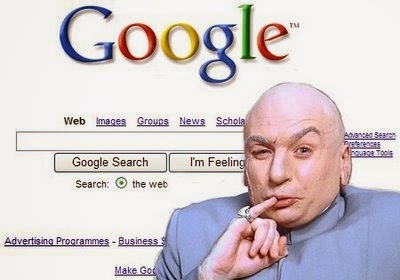 Google's Evil and it Hates You. There's trouble afoot! An unknown whistle blower appears to have lifted the lid on some rather unscrupulous actions from Google in regards to its AdSense programme. Claiming to be a former AdSense employee, the anonymous secret-sharer states that Google has initiatives set in place to shutdown and ban lucrative AdSense clients days before their payout. This is tantamount to stealing, and if these allegations prove true Google could find itself in a bit of a sticky wicket. The mystery informer went on to claim that he/she participated in a programme where Google's AdSense team purposefully red-flagged accounts when they reached earnings of $5,000 or $10,000. However, certain clients were exempt from such action, implying some under the table dealings between Google and certain VIPs. Could this be true? The nameless bean-spiller claims "I have communications. I have documents, I have files, I have lists, and I have names. I have all of it." Whilst Google was quick to dispel such claims as purely myth, many former AdSense clients took to forums to express their stories of being banned for unexplained reasons just before their payouts. The full, very detailed text of the claims can be found here. I personally reckon this is true and I think it's about the time this veneer of Google as this benevolent, ethical company to come crashing down. Call me a cynic but no company can realistically become worth hundreds of billions of dollars without being at least a bit evil. Sporting brands can't be profitable without using child labour in East Asian sweatshops. Big pharma can't keep stockholders happy without jacking up the price of pills for those with chronic illnesses. Cosmetics companies can't create new shampoos and lipsticks without first drowning some puppies in conditioner while the mother looks on. It's just good business. If this is the only evil thing that Google's doing (and it probably isn't) then, considering its size, it's still one of the more ethical companies out there. How Far Will A UK Pension Take You Abroad? Should Google commit to Paying its “Fair Share”?